Masa (pronounced MAH-suh) has been practicing massage therapy for nearly 10 years, after graduating from the massage program at Remington College in Honolulu, Hawaii while her husband was assigned to an Army base on the island. Originating in Okinawa, Japan, Masa has lived all over these beautiful United States while serving as an Army wife for more than 20 years. Now that her husband has retired from the military, Masa considers herself lucky to call the Pacific Northwest home, finally settling down near friends and her husband’s family. Planting roots in Eugene has allowed Masa to pursue her own career helping people heal and feel their best, a pursuit she is passionate about. 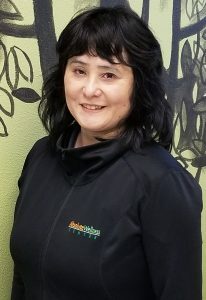 Masa is a member of NCBTMB (National Certification Board for Therapeutic Massage and Bodywork) and has been licensed as a chiropractic assistant since 2011, allowing her to specialize her practice on medical and therapeutic massage. She also has extensive experience in deep tissue massage, prenatal massage, infant massage, sports massage, and cupping. Her primary focus is deep tissue massage and trigger point treatments, as she often finds these help patients recover from injuries the fastest. Masa’s patients comment on her ability to find sore spots they might not have even been aware of yet, and she is incredibly flexible in her strength and techniques. If a patient needs deeper work, they need only ask. Masa is also more than capable of providing a more gentle and relaxing massage, always encouraging her patients to speak up about their needs and preferences. Masa has a wonderful sense of humor and truly enjoys working with her patients, getting to know them through the healing process so she can best meet their needs and ensure their swift progression through their treatment plan. When not at work, Masa enjoys spending time with her dogs. She and her husband rescued three precious (and precocious) dogs from a county shelter in Texas near their old home. Walking the dogs and attending Jazzercise a few times a week keeps Masa fit and healthy, but she also enjoys her down time. She has been taking photographs from her extensive world travels for many years, often scrap-booking albums to enjoy and share. If you are interested in learning more about the benefits of massage, and particularly how it works so perfectly in conjunction with the other therapies offered at Absolute Wellness Center, please check our Massage Therapy page or give us a call to discuss your specific needs at 541-484-5777. –Is Massage Really Good For You or Just Fun? –Consider a foot massage next time you want to kick-start your health!